Johnson County Judge/Executive R.T. “Tucker” Daniel signed a proclamation declaring May as Community Action Month in Johnson County. Pictured are Big Sandy Area Community Action Program staff members Faye Rife, Alecia Conley-Knox, Edith Hill, Executive Director Mike Howell, and Cathy Tackett. 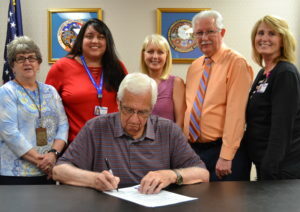 On Wednesday, Johnson County Judge/Executive R.T. “Tucker” Daniel signed a proclamation declaring the month of May to be Community Action Month in Johnson County to align with the state and national Community Action Month celebrations. Community Action Month honors the work of over 1,000 agencies across the United States which are dedicated to connecting millions of children and families to greater opportunities, transforming their lives, and making our communities stronger. Locally, Johnson County is served by Big Sandy Area Community Action Program (BSACAP). This year, as part of Community Action Month, Big Sandy Area Community Action Program will be accepting donations of bottled water and gallon jugs for the citizens of Martin County. At different points throughout the year, BSACAP provides college scholarships, vouchers for home gardening materials, and assistance with home heating costs for low-income individuals and families. All year though, the agency provides weatherization, rental assistance, Head Start, Goodwill vouchers, and SS/SSI Representative Payee services to low-income individuals and families, and educational workshops and career services to people of all income levels. 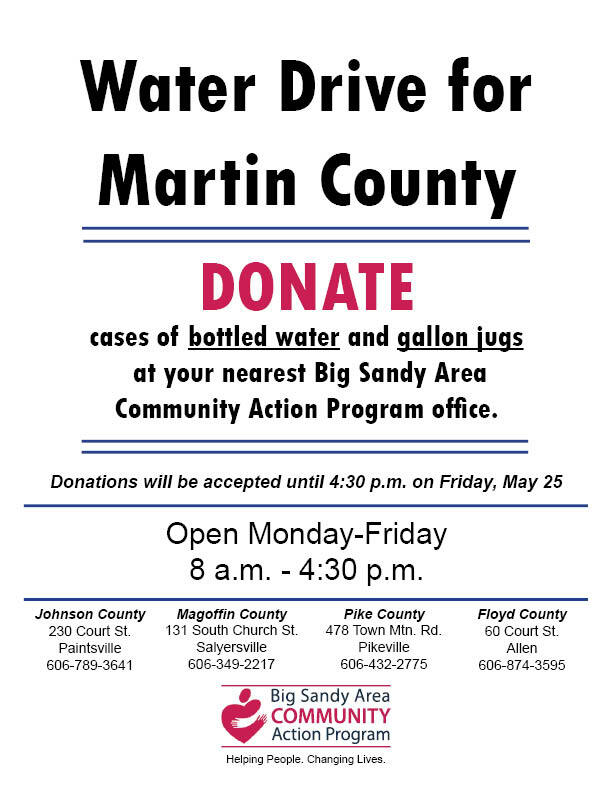 As a result, Big Sandy Area Community Action Program will celebrate the month of May by collecting donations of bottled water and gallon jugs at each of their county office locations through Friday, May 25th and then delivering all donations to Martin County for distribution. If you would like to join in helping Martin County, you can drop off your donations of water at the Johnson County Court House, 230 Court St., Paintsville. If you have any questions, call (606) 789-3641. Offices are open Monday through Friday, 8 a.m. – 4:30 p.m.
BSACAP will not be accepting monetary donations for this particular project. If you wish to make a monetary donation, please do so through the Rockin’ Appalachian Moms Project (RAMP), who will be distributing the donations on behalf of BSACAP. Visit their website at www.rampamerica.org. In Martin County, contact Melissa Stepp, RAMP Program Director at 606-626-6654. For information about Big Sandy Area Community Action Program, follow us on Facebook.